The ship’s bell strikes in 30 minute increments over a 4 hour “watch” period. There is one bell strike for each 30 minute segment beginning with a single bell strike at half past midnight and counting up to 8 bell strikes at 4:00 a.m. marking the end of the 4 hour watch period. At this point the bell strike pattern begins again at a single strike at 4:30 and counts up to 8 strikes to 8:00. The cycle is continuous over the 24 hour shift watch period. The ship’s bell system of chimes evolved from a crude sand clock dating back to the time of Columbus. This primitive clock was called a sand or sandglass clock, and was an essential device for marking the time at sea. Records of epic voyages tell us about this device and how the helmsman used it to measure time in half-hour increments. Watches or shifts were organized into increments of four hours; a custom that is still widely used. 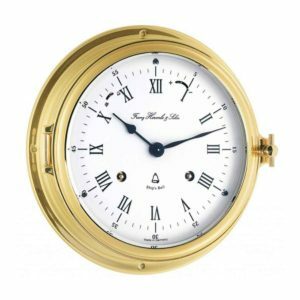 With the sandglass at his side, the helmsman would signal the passing of half-hour increments starting with the strike of one bell at the end of the first half hour, two at second and so on until reaching eight bells, which signaled the end of the watch. The tradition of the sand clock continued for hundreds of years and was replaced only by the development of the mechanical clock. But, it was not until the 19th century that the first mechanical ship’s bell clock was produced in America. The principle of this American innovation remains almost unchanged to this day.